Relocating To Orlando or moving from Rockledge? Wheaton is the moving company in Orlando that is ready to provide you with the moving services you need. From the day you start packing to the final delivery of your belongings, count on Wheaton to meet your every need. Ready to get started? We’ve made it simple—get a free, instant moving estimate on your move here. Want more information about moving in Northern Florida? Backed by the reputable Wheaton World Wide Moving brand, these moving companies will deliver a safe, efficient and hassle-free move for your household goods. Each agency is required to meet Wheaton’s high standards for customer service, quality and performance—among the highest in the industry—to ensure you and your family can have peace-of-mind throughout every step of your move. Every move is unique, and that’s why Wheaton goes the extra mile to ensure that your one-of-kind needs are met. Our excellent service means you can relax during your move. After decades of service to their communities, these moving companies know Florida better than anyone else. These agents live in your communities and have likely provided relocation services to houses in your very neighborhood. You can rest assured they’ll recommend the best resources, the most efficient routes and the ideal time slots to ensure your household move is executed as quickly and efficiently as possible. 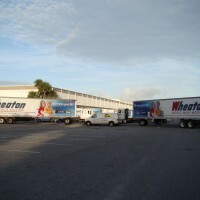 Wheaton has three moving agents in the Northeast and central Florida. Wheaton movers are the perfect source for all of your long distance moving needs. Long distance moves requires a structured planning process in which the movers at Wheaton have mastered. Whether you are moving to a neighboring state or cross country, we have the movers you can trust. From planning to packing and loading to unloading, you will have direct access to a Move Coordinator that is your single-point of contact. This ensures your move will be executed to the quality you expect. Start planning your long distance move today by filling out a free moving quote, or giving us a call. Ready to Begin? Get a Moving Estimate! Request your free quote right now. We’ll use your estimated travel distance and shipment wait to provide you with a quick, no-obligation estimate.